1. BG's 1957 crusade in NYC ran for 16 weeks from May 15th - September 1st. It was aspects of this crusade that resulted in fundamentalism's rift with BG. 2. Pillsbury opened in the fall of 1957. 3. If the picture was in fact at a "PBBC Christmas party," the earliest therefore it could have been taken was at Christmas, 1957 (several months after the rift). Which isn't to say that Clearwaters might not still have been cordial with BG following the rift. Doc Clearwaters had know BG for several years before 1957 (and W.B. Riley had been a mutual friend). In March, 1956, Clearwaters wrote in an article, "We have worked with Billy Graham and sat in his meetings in Minneapolis  and Wimbley, London..." [sic; he's referring to BG's 1955 Wembley Stadium meetings]. Later in the article, in response to criticisms leveled against BG by others, Clearwaters wrote, "The writer agrees heartily with Billy Graham and stands with him against these critics in this matter." IF that is Clearwaters and IF that is Graham, could it have been taken at Bob Jones College in Tennessee and Clearwaters was a guest lecturer? I'm not sure of my timeline. 1. Looks like BG to me, and also looks like RVC to me. (I was at Fourth Baptist from 1972 to 1981.) RVC in the photo is much younger than when I first saw/met him, but I don't doubt it's him. Plus, as I mentioned, BG and RVC were acquainted for at least several years (with Fourth Baptist and the BGEA headquarters in Minneapolis only about 2.2 miles apart (per Google Maps) at that time). 2. The "Randy Miller" of the photo credit is a PBBC alum (1979 I believe) who has long collected memorabilia of PBBC. I'm skeptical the photo was taken at PBBC (see my post above), but I have scant doubt it's of who he says it is (but where is the question). FLASHBACK FRIDAY #8 s at Northwestern College in the Twin Cities. Even though their homes in northern Wisconsin and Michigan were not many miles apart, my parents never met until they arrived to attend Bible College at Northwestern in the mid 1950's. W. B. Riley, longtime pastor of the First Baptist Church, was the founder of the school and served as President from 1902-47. Riley named Billy Graham, then just in his early thirties, as the President, and he served from 1948-52 so this photo was taken in the early 50's. During his tenure, radio station KTIS was started. That is Billy Graham mugging for the camera in the lower left. As far as I know, this was a funny shot taken at a Christmas party. Who is the teacher standing at the front of the room? It is Dr. Richard V. Clearwaters, then Dean of the Northwestern Seminary as well as the pastor of the Fourth Baptist Church. In 1956, with the blessing of Northwestern, Doc would found Central Seminary and then in 1957 he founded Pillsbury. Northwestern really went into a period of dormancy for a time. For all practical purposes, Northwestern closed from 1966 (only KTIS was operating) until they reopened on a new donated campus in northern St. Paul in 1972. As per our usual Flashback Friday policy, please no negative or critical comments (they will be deleted). Thanks Don for that information! That fills in the blanks. Billy Graham lived to age 99 (1918 - 2018). Richard V. Clearwaters lived to age 96 (1900 - 1996). I mentioned the 1957 rift between fundamentalism and Billy Graham in a post above. Pickering later become a successor of R. V. Clearwaters at Fourth Baptist. I think it's of interest because it's a contemporary account of the issues that fundamentalism saw with BG at the time. IMO, It would be interesting if someone with the time & energy did an analysis of the pamphlet from a current perspective. Do the issues still ring true today? Do any of its criticisms now seem unfair? What did history prove correct? Etc. Rolland McCune, sometime commentor at SI, dealt with this in his book. I think his analysis might be what you're looking for. Pretty sure he dealt with Pickering's pamphlet directly. Imo, the issues are still important. I believe the picture was taken at Northwestern. Remember that Doc taught there and was dean of the seminary in the 40s and into the 50s. We saw the picture when I was a student at Central from 1963-1967. Thanks! I was planning on a Billy Graham piece this week and next. 1st row ... the young man ... seems oblivious to the camera. 2nd row right: my favorite ... what's in his hand? around his neck (a napkin?)? It's the type of photo (perhaps with a caption identifying RVC and BG) that belongs on the wall in Central's break room: a real conversation piece. Below is a photograph taken in 1949, when Billy Graham was the president of Northwestern Schools in Minneapolis. 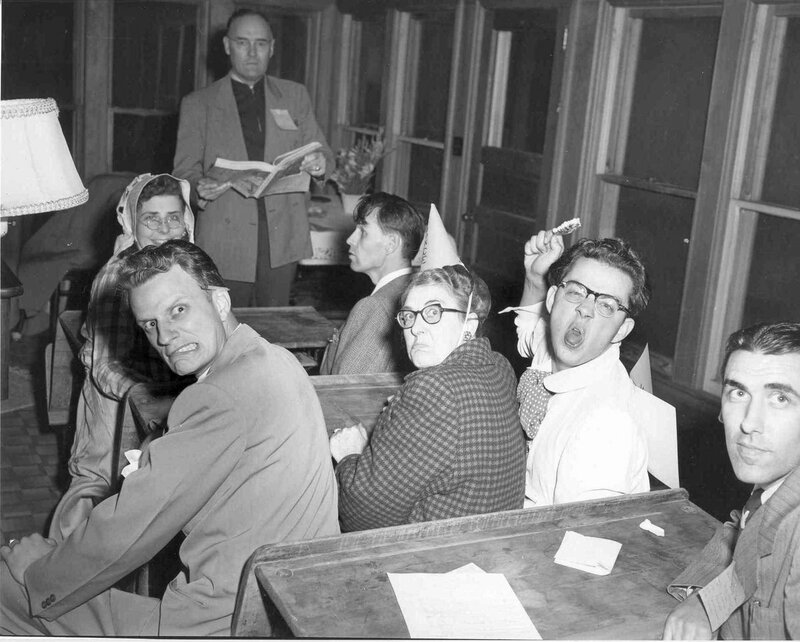 It shows a spoof, a skit during a relaxed moment at Northwestern. In the picture, Richard V. Clearwaters stands as if teaching a class. In the back row of the class sits Marie Acomb Riley (W. B. Riley’s widow) wearing a dunce’s cap. To her left, and hamming it up for the camera, is President Billy Graham. Photo provided courtesy of Drs. Charles and Helen Aling. Taken by Don Nelson at Northwestern Schools in late 1948. Pictured are Richard V. Clearwaters (speaking), Jean Makas, Leroy Gager, Billy Graham, Marie Acomb Riley, George Makas, and Gerry Bevin.